A few weeks ago, I spent a very relaxing holiday on the Greek island of Paxos. To get there, you fly to Corfu and then get a ferry to Paxos which gave us the opportunity to spend a few days in Corfu town. I can recommend it. Bars, restaurants, narrow shaded streets, friendly locals and to cap it all, a couple of Venetian fortresses to wander round, something of a hobby of mine. I love military architecture. 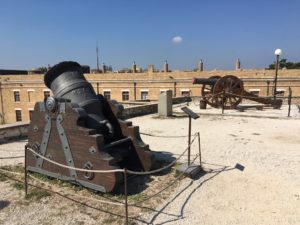 If you walk round the older of the forts which is on the water front, you eventually, after stopping off for a restorative beer in the Corfu Yacht Club which is conveniently situated about half way round and also does an excellent lunch, you end up on a large flat area on which are a number of old artillery pieces. The picture below is of two of them. They are both cast iron and were supplied to the Venetian Republic when they ruled Corfu. The one in the background was cast in Bremen in 1711. The large mortar in the foreground, however, was the more interesting piece. It was cast in Sussex by a Thomas Webster in 1685 and is one of a pair. Two thoughts sprang to mind as I crawled all over them. Firstly, we’ve been making interesting and technically challenging castings in the UK for a long time. Secondly, even over three hundred years ago, sourcing and buying castings was an international affair. I think sometimes, particularly in smaller organisations, we forget the second point – or chose to ignore it. It’s no good just automatically assuming that the castings you make now for customers you’ve always made them for will continue to be ordered just because that’s the way it’s always been. Admittedly one of the buzzwords bandied around recently has been ‘re-shoring’, bringing casting work back to the UK that disappeared overseas years ago, usually due to cost. This is happening but the reverse is also true, although not so much to the far east, particularly for small to medium batch production. Some of this can be sourced very competitively in Europe. As the UK finds it’s place in the world post Brexit, the ability of organisations to source castings and develop supply chains that maybe don’t include their traditional suppliers in the UK has the potential to make this more of a problem. I know this to be true as I’ve had this conversation with two existing customers, both large international companies, who are considering doing just that and we’re not talking large volume work. For one customer, we supply a range of about 50 items, the quantities varying from 1 off to 30 off bought as and when they need them. The post Brexit landscape is going to be interesting – ‘May you live in interesting times.’ is a Chinese curse – and UK manufacturing’s ability to weather whatever the politicians throw at us will determine how successful we all are in the new international landscape. Finally, just to show how things come full circle, the link below is to a modern version of the Bremen made cannon above. We cast it a few years ago for Hazard’s Company who are part of The English Civil War Society. It makes a suitably loud noise.